It's mid-June now, and that means summer is here. It's hot out there, especially here in Los Angeles. Most people, when I mention having a hot chocolate in the summer, look at me oddly and say something like "But it's so hot in summer, I like hot chocolate in the winter". It makes no difference that while they're saying this, they may be holding some scalding hot coffee or tea, probably their third or fourth of the day. People just associate hot chocolate with winter and Christmas. Let's try and change that, ok? But not today! Today we're going to ask the hot chocolate to cool down a bit for us. 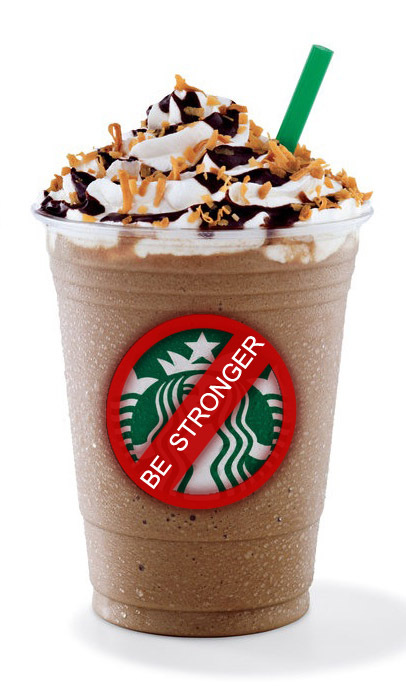 Of course, lots of folks love iced coffees and frappuccinos. And yep, there are iced hot chocolates out there, too! 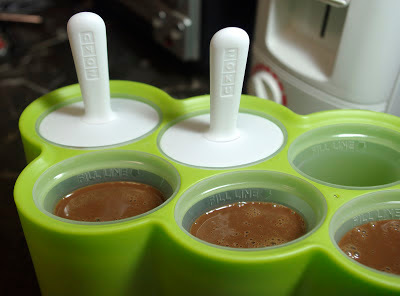 I'm going to explore a bunch of them all summer long, starting with some good old fashioned frozen chocolate pops. 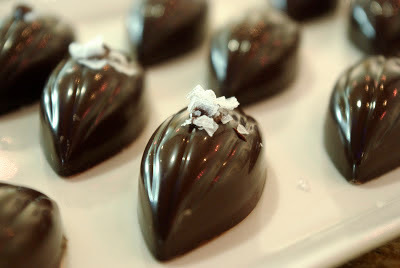 Taza Chocolate came up with this recipe, using the coconut milk as the base. I switched it around a bit because I didn't have any of their Oaxacan discs handy. Baker's, you've seen that stuff, right? It's in the baking section of the grocery store. 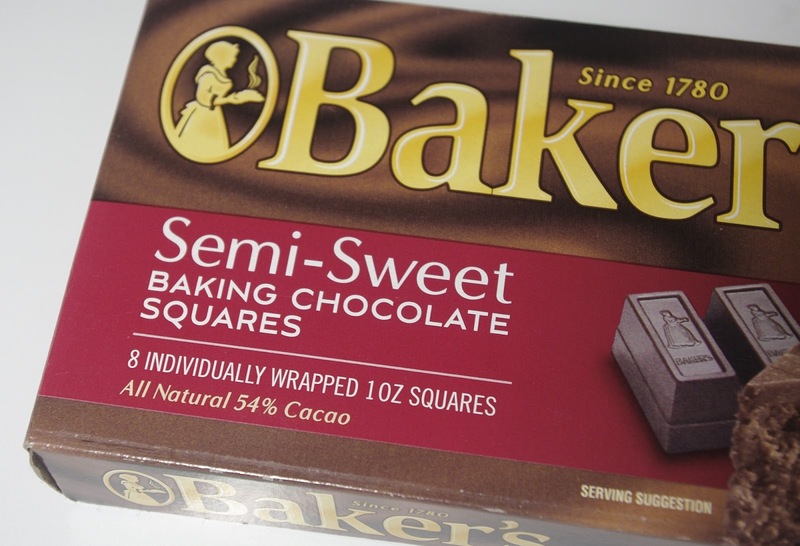 Did you know Baker's was the first producer of chocolate in America? I'll bet you thought it was Hershey's. Nope, Baker's was here before them - over 100 years before them! The Baker's box says 1780, but Dr. James Baker and John Hannon were importing beans and making chocolate in Massachusetts as early as 1764. So don't walk by Baker's thinking it's some off-brand you're afraid to try. It's 12 years older than our country is! These are the popsicle molds I have. They are great! We usually fill them with lemonade, but today, they will experience the majesty of chocolate. Turn on your stovetop and get the coconut milk into a pan. 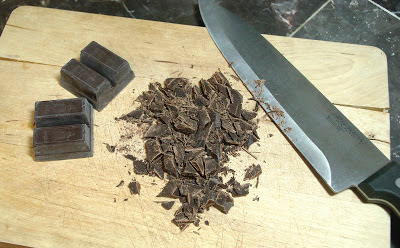 While that's warming up, chop up the chocolate. If you've been following this blog, you know this helps it melt much faster. Always chop the chocolate. Once the coconut milk is nice and hot, add in the chocolate, the sugar, and the cinnamon. 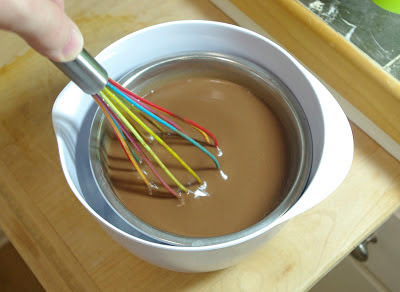 Whisk it around, make sure everything is incorporated nicely and the chocolate melts smoothly. And taste it! It's really good. Really, really strong, but definitely delicious. If we were going to serve this as a hot drink, maybe we'd tame it down a bit with a cup of milk or something. But we're not, so just let it be its thick, strong, tasty self. We now have an almost-boiling pot of coconut chocolate drink that we need to put into the freezer. Let's help it cool down first, though. We don't want to melt our popsicle molds. I set up a little ice bath for it. 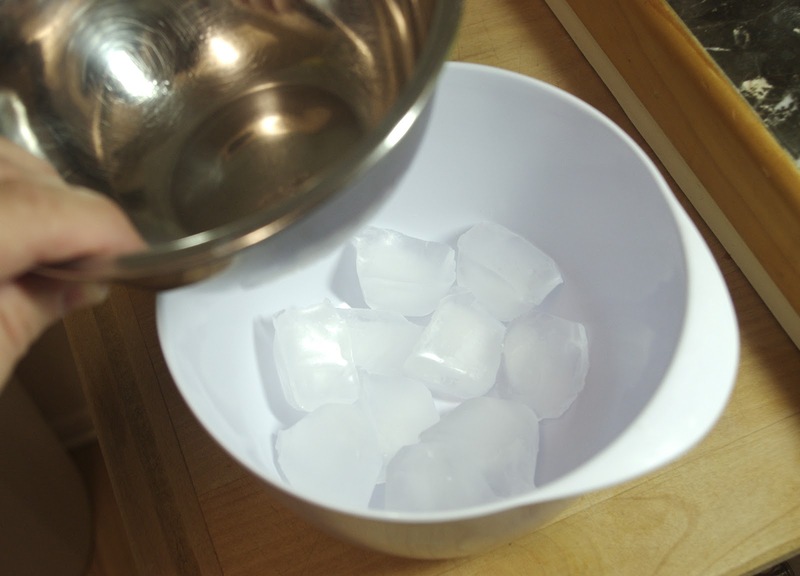 I filled a large bowl with ice cubes, then put a smaller metal bowl on top and made sure it was sitting level. 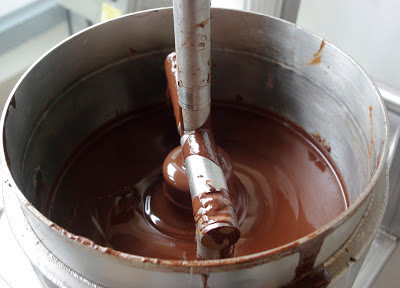 Then I poured in the warm chocolate and stirred it for maybe 5 or 10 minutes. 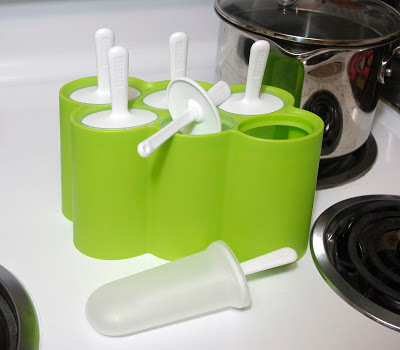 Once it was at about room temperature, I filled the popsicle molds. They have a little fill line marked on the inside. Stick to that! 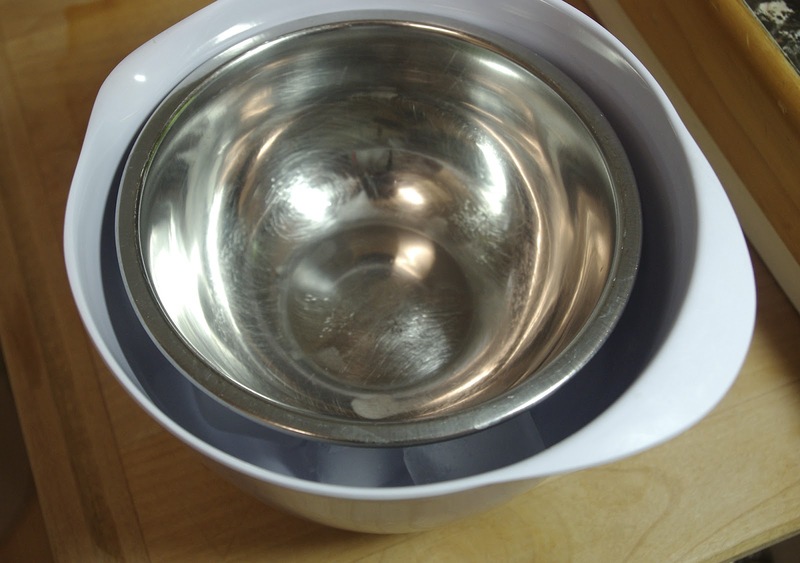 If you're freezing something with water in it, the water expands a little bit. With these chocolate pops, it leaves a little space underneath for dripping. Throw them in the freezer, and in 8 hours, bust them out and enjoy! They are so good! Addicting, even! They are still pretty strong, but if you liked fudgsicles growing up, then you will love these! 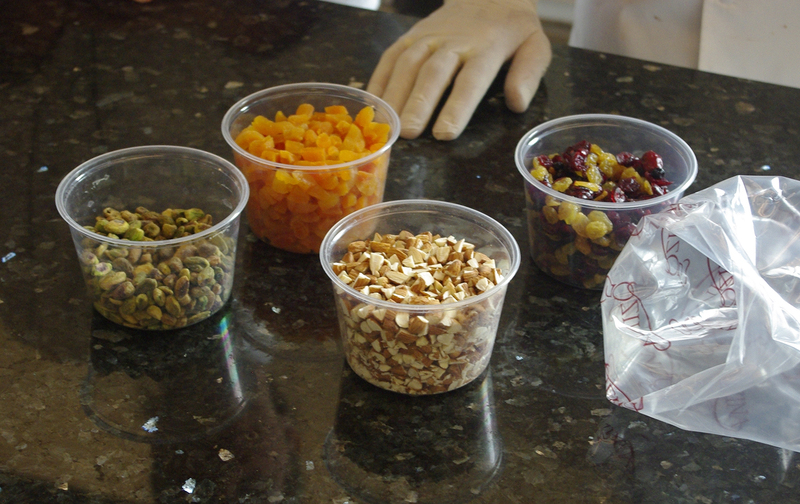 And of course, you can change up the recipe to create any flavor combination you want. Maybe some chili powder mixed in there? 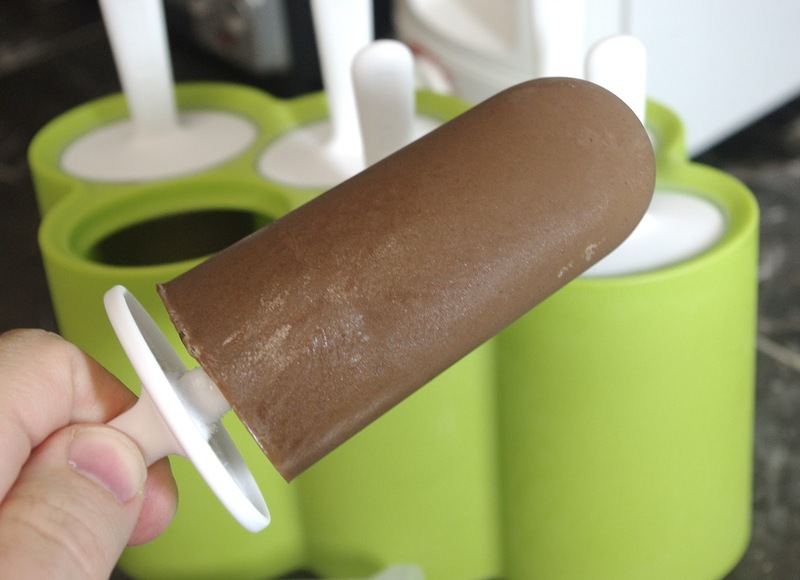 I know, I know, "It's summer, it's hot, who would want to add chili into a popsicle..."
This time, we're adding some maple into the cup with that chocolate we love so much. 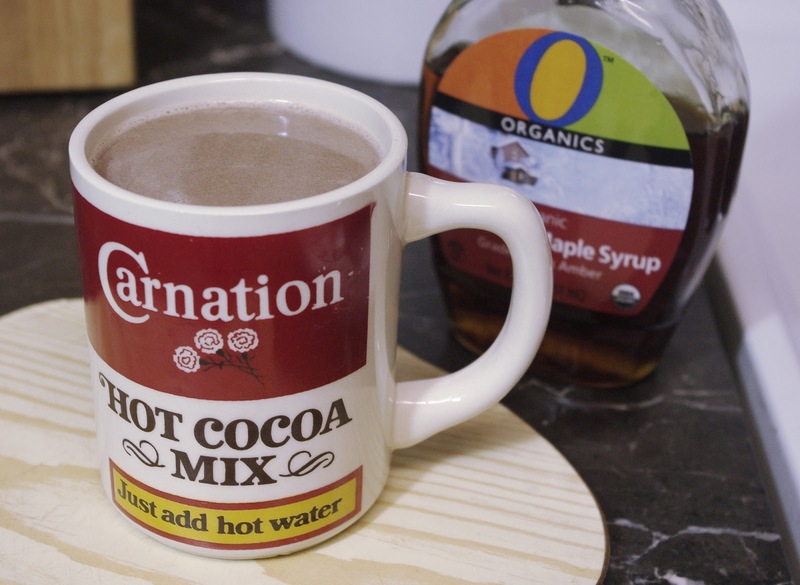 This is a great variation on a normal, milder hot chocolate. 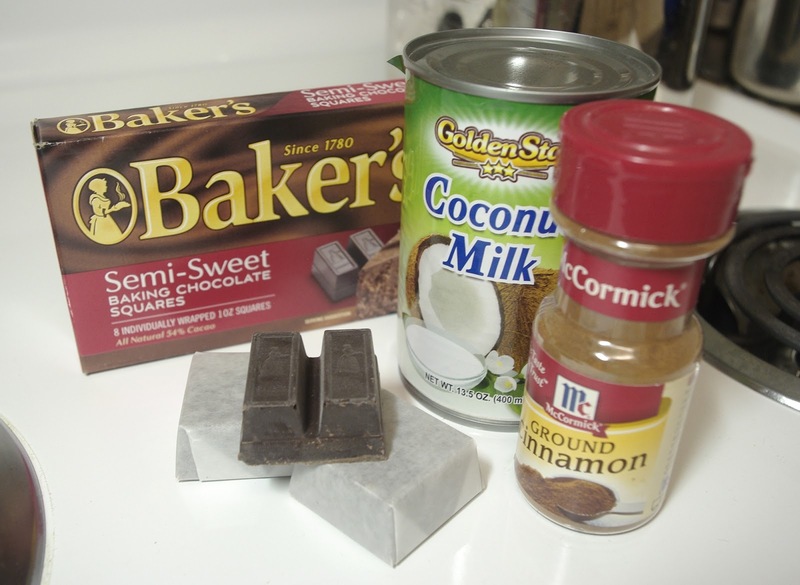 When I first stumbled upon some recipes, I thought it would be way too sweet to be any good. Boy, was I wrong! The chocolate is light, the maple isn't overpowering, and this cup is just plain delicious. It's the kind of hot chocolate that I think of as a breakfast hot chocolate rather than a dessert hot chocolate. In fact, it's one of the few I've made that my girlfriend asked for more of! Crazy ingredients list, huh? I know you're wondering "Butter?!" Yep, butter. And I'm serious about the real maple syrup. If it's not 100% real, it's just flavored corn syrup. If you're gonna use that, you may as well just make your hot chocolate from a paper packet. 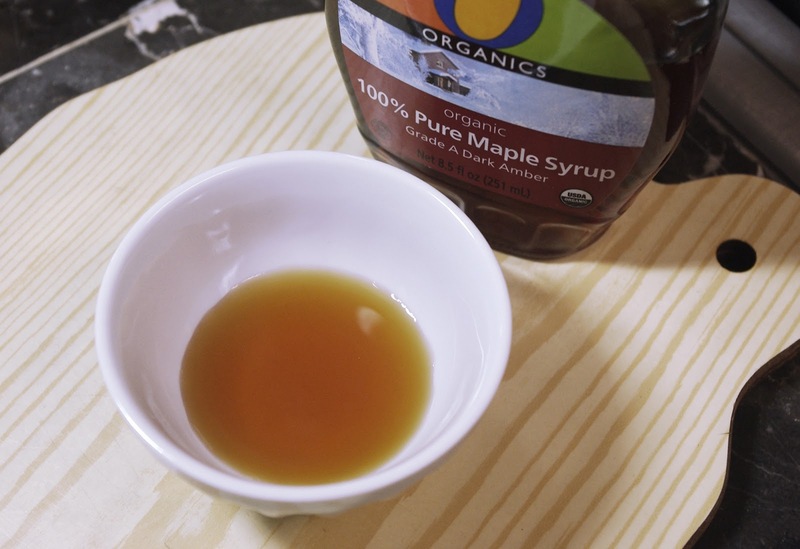 Real maple syrup not only tastes better, it's better for you. Of course, like any sweetener, you should use it in moderation, but seriously, if you're at the store and you're buying syrup that tastes like the sap of a tree, why not buy the real sap? Save the corn syrup for marshmallows! And what's that weird box in the ingredients picture? Let me show you! Polish cocoa powder! 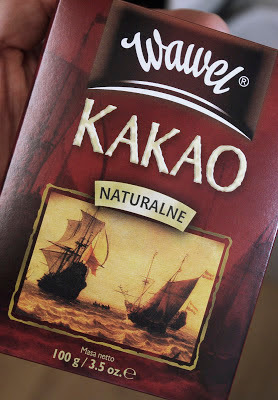 I've been coming across many cocoa powders from different countries in the international markets around town, and I've been snapping them up as more interesting options than just the standard American cocoa powders (mainly Hershey's, which I'm betting is what everyone has in their house). 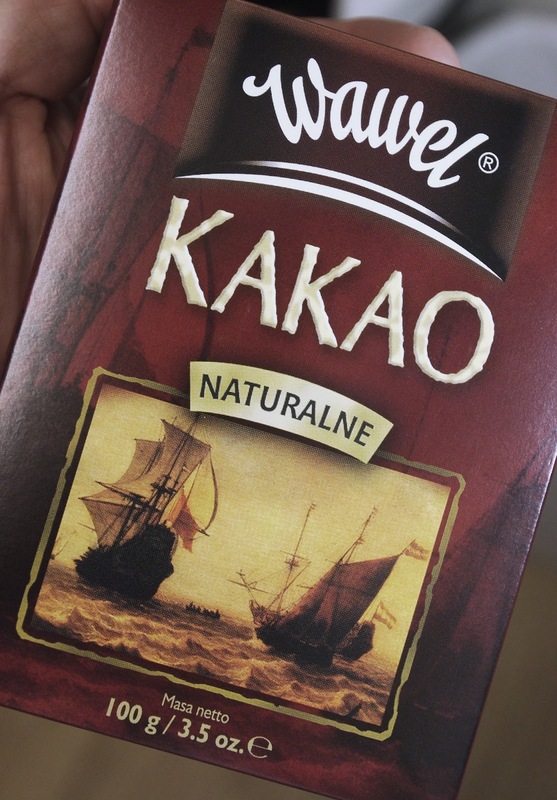 Wawel is Polish chocolate maker, and that artwork on their box is just awesome! Did they put chunks of chocolate on it, or cacao pods? No! They put ancient warships battling on it! Actually, I have no idea if those are warships, or if they're battling, but it's awesome nonetheless. 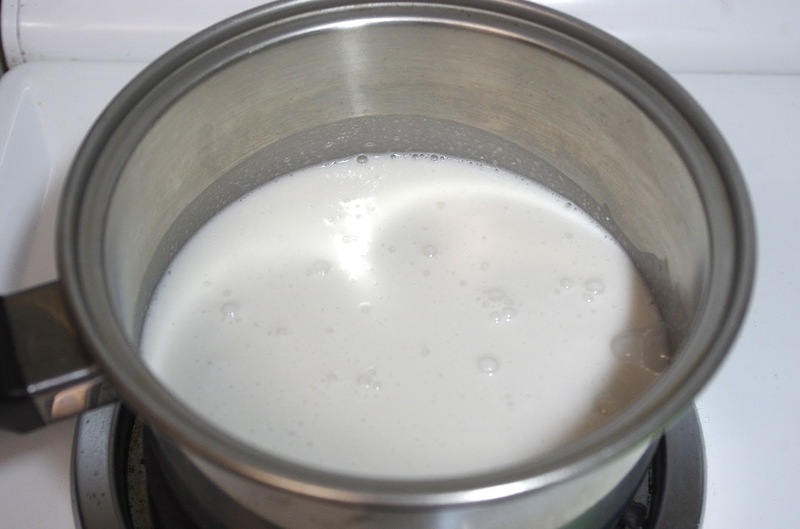 Add the tablespoon of water into the milk and heat it up. While that's warming, measure out the remaining ingredients. 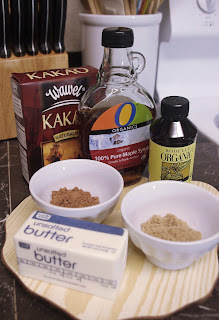 Keep the maple syrup separate from the others - we'll add it last. Once the milk is nice and hot, but not boiling, go ahead and add the brown sugar, cocoa, butter, and vanilla. 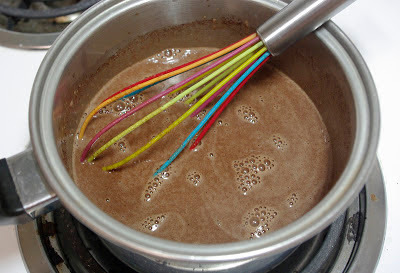 Whisk it together until there are no clumps of cocoa powder and the butter is completely melted. 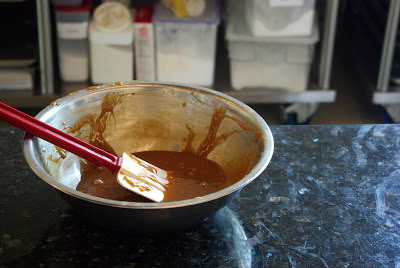 Then finally, turn off the heat and mix in the maple syrup. Once that's in, you're good to go! I recently got a few retro hot cocoa branded mugs from ebay, so you'll be seeing them pop up on here, regardless of what hot chocolate I'm pouring into them. This Carnation one is filled with maritime battle-worthy cocoa powder and the blood of trees! Try it out, let me know what you think! That refining is called conching. The goal of conching is to refine the particles in the cacao mass small enough that the tongue cannot detect them, which means the chocolate will feel nice and smooth in texture. But let me back up for a minute. At the end of Day One, after our chocolate was in the refiner with the other ingredients, we had time left. 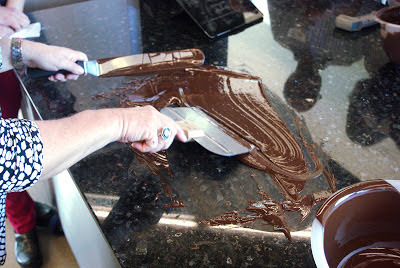 So Chef Francois grabbed some chocolate that he had made the day before and we tried our hand at tempering it. 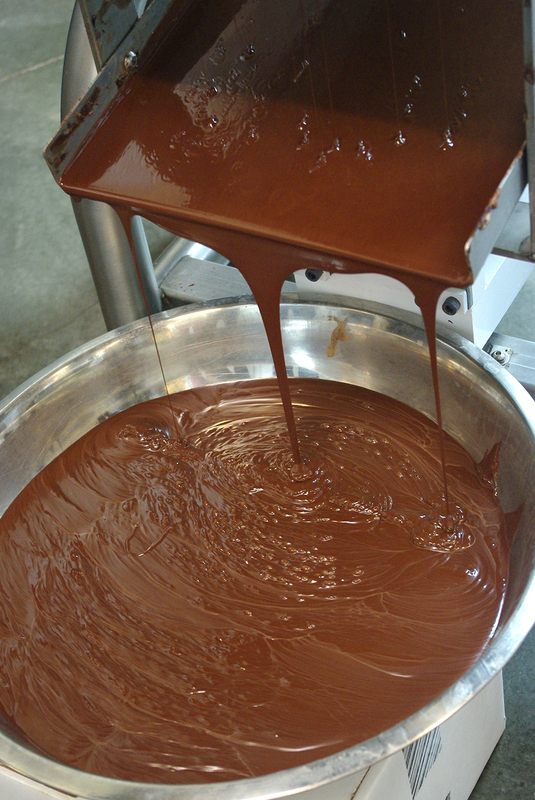 Tempering. That's an odd word if you're like me and have no idea about anything relating to the science of cooking and confection making. They temper steel, I think. 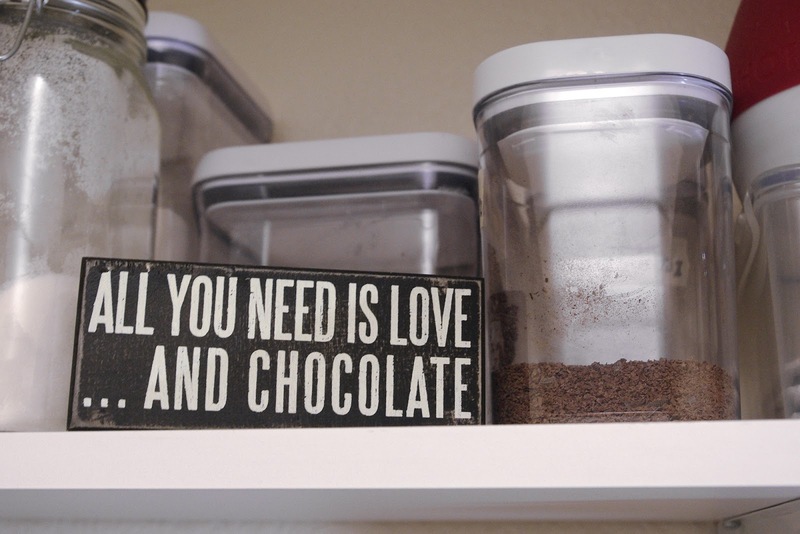 Well, they temper chocolate, too. When chocolate begins to cool and become solid, what's happening is that the cocoa butter is turning from a fatty liquid into a crystal. 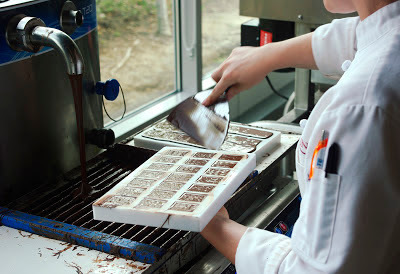 Tempering is, basically, making sure that only very small crystal are formed, giving the chocolate a glossy finish, a nice snap when you break it, and lets it re-melt around body temperature. Tempering chocolate consists of heating and cooling it to some very specific temperatures, and those temperatures and the order in which they are achieved ensure that only very small crystals are formed. 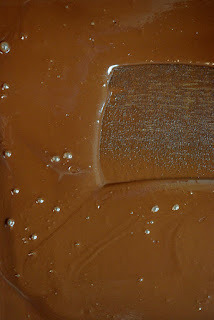 Once that is done, the chocolate cools very nicely, it's shiny, it snaps well, and melts just as you would expect it to. You can temper chocolate very carefully on a stove, but the industry has, of course, created some high tech machines to run through the correct procedures automatically. We'd be using the machine to temper ours, but first, Chef Francois wanted us to try tempering some chocolate on the big marble table there in the kitchen. 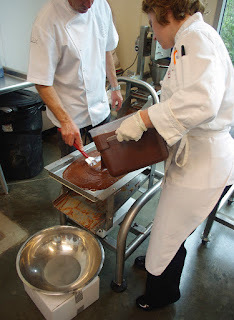 We poured a little of the chocolate out on the cool table and began spreading it and scraping it back into itself, trying to bring the temperature down evenly throughout. 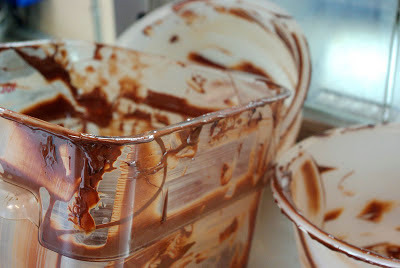 Once it started thickening, we'd put it back in the bowl, and the chocolate that was beginning to crystallize would hopefully cause the whole batch to solidify with the small crystal structure. For some of us, it worked. For some of us, not so much. 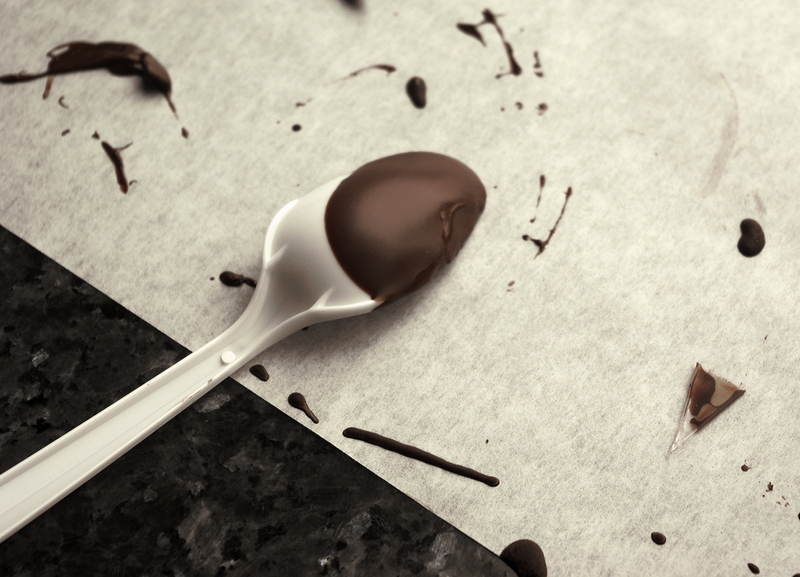 We used this chocolate to make some raspberry ganache-filled bon bons. Since this wasn't the chocolate we made ourselves, I wasn't too excited about it, but it was still fun. 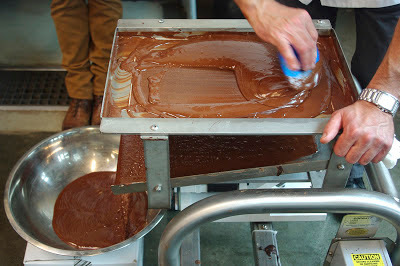 Ok, less talk, more pictures of chocolate making! Back to Day Two! 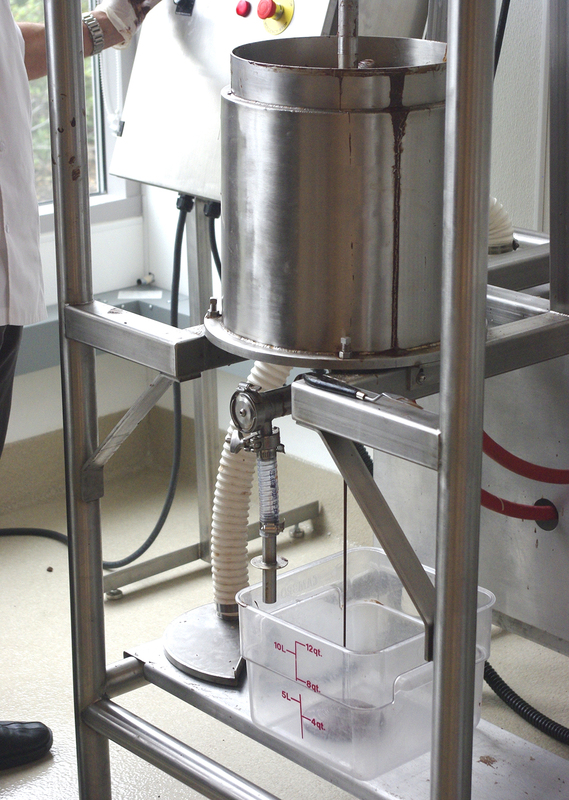 We drained the refining machine once the conching was done. 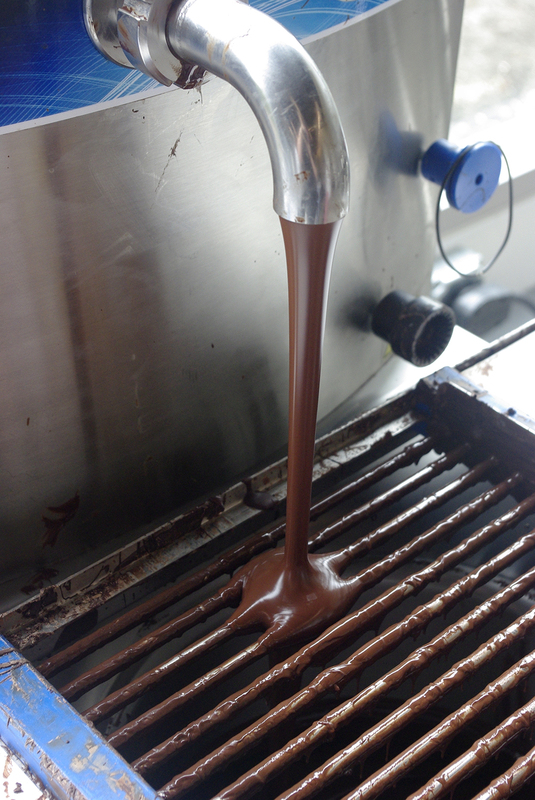 You can see the thin stream of chocolate pouring into the bin underneath in this picture. Oh man! 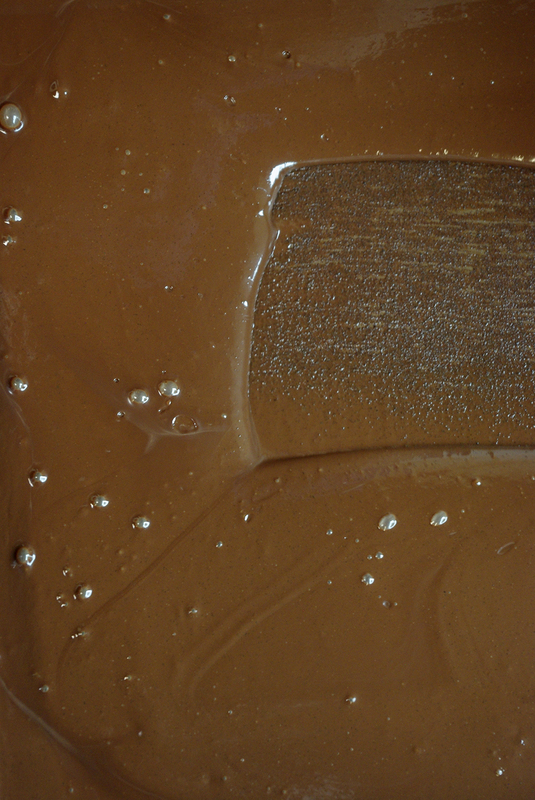 That is brand new, sweetened, delicious, molten chocolate! The urge to just put my hands or face into this bin was almost overwhelming! Still going! We filled this bin just about to the top. I still get chills just looking at the pictures! 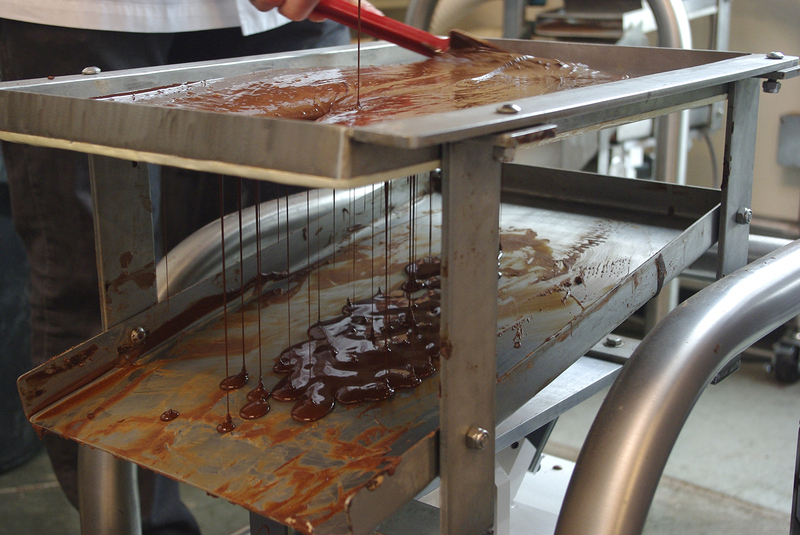 One last step before putting it into the tempering machine - sifting. This machine had a fine mesh screen on top, and when switched on, it vibrated like crazy. The liquid chocolate would slowly work its way through the mesh, run down the pan, and drip into the bowl. 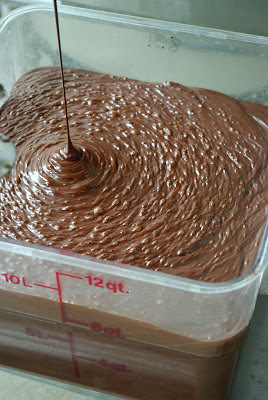 I can seriously look at pictures of liquid chocolate all day long. You know that chocolate river in the original "Willy Wonka & the Chocolate Factory"? I loved that! I dreamed of seeing that in person! And this, while not quite a river, is 20 lbs of liquid chocolate! Click on this picture to see the big version. For reals. 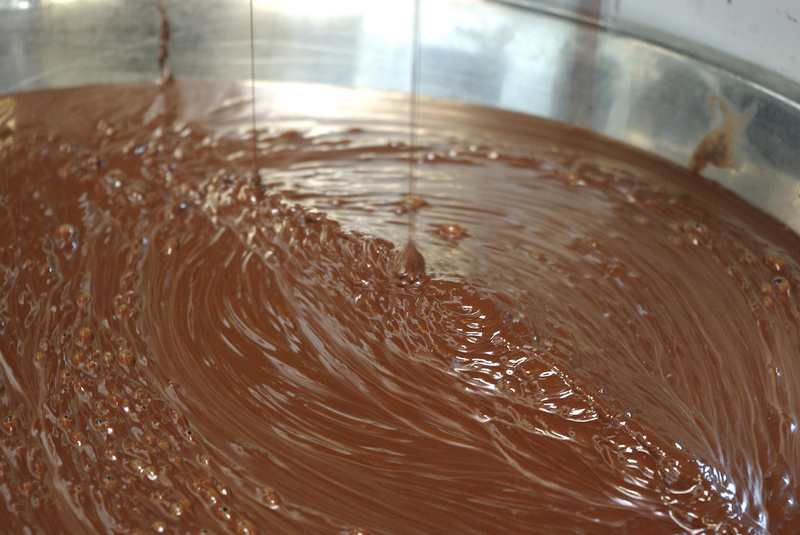 Here you can see why we're sifting it. See that grainy stuff? That's the germ of the cacao bean. It's a hard little stem inside the bean, and it's so hard it doesn't really break down through all the grinding and refining we've done. Being almost impossible to grind down, the easiest solution is to sift it out. 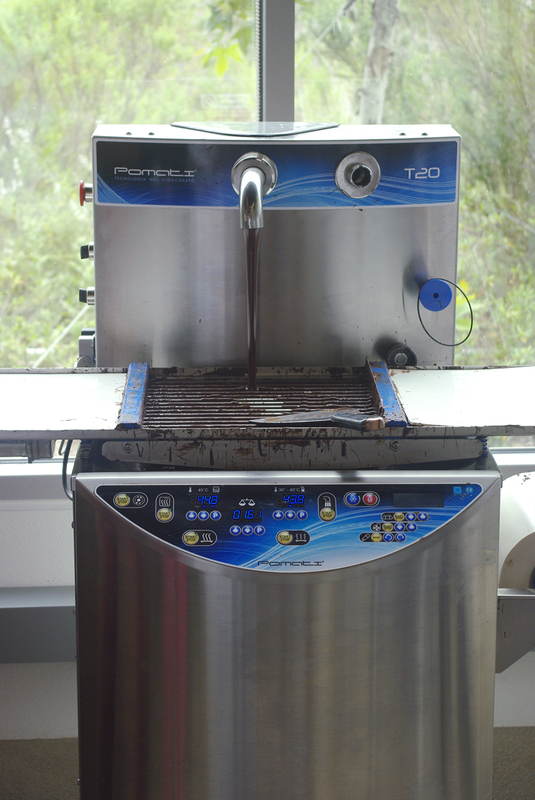 This is the high tech tempering machine I was talking about earlier. You just pour all your chocolate into it, and it runs through an automatic cycle of temperatures so that the chocolate will crystallize perfectly. Once it's been in here through the whole cycle, it's ready to go! 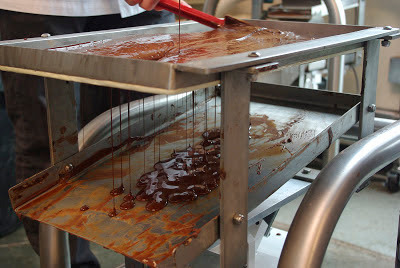 Ready to be turned into candies, molded into bars, or for bathing in-- I mean, molding into... uh... nevermind. This is how we tested the tempering. We'd run a spoon under the stream, then set it aside for a few minutes to see how it cooled. 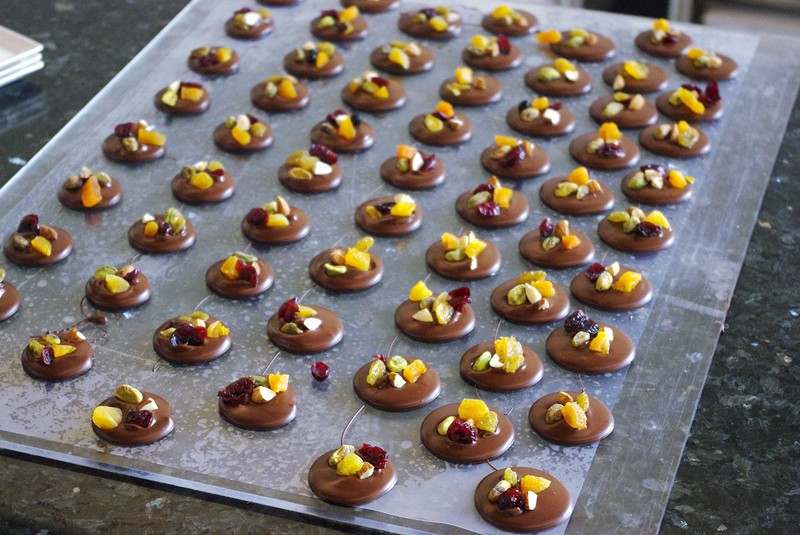 The first thing we made were little chocolate candies called mendiants. Mendiant means "beggar" in French, and the original toppings were meant to represent the robe colors of four different monasteries. 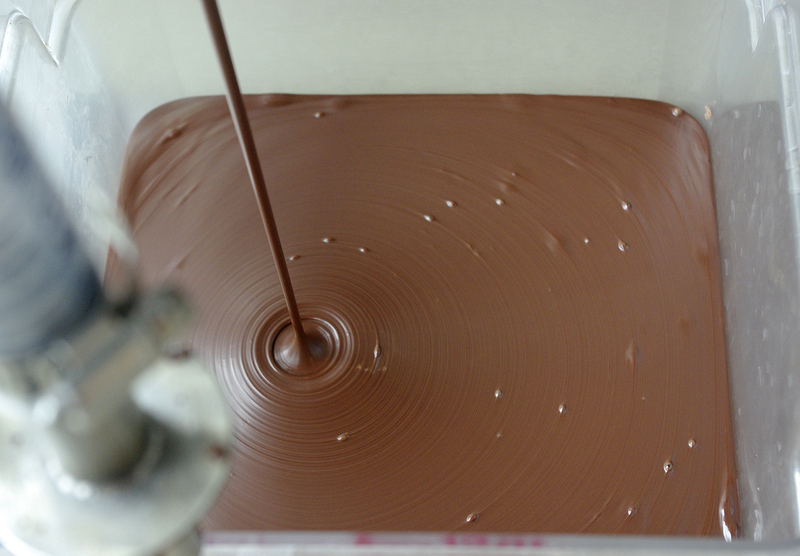 They start with just a dab of chocolate. Once the pan was covered, we banged it on the table a few times to smooth them out. Then we started putting on one each of our toppings. We made two of these sheets. Tons of them! Part of the class is leaving with a pretty huge box of chocolates, and these were a big part of that. 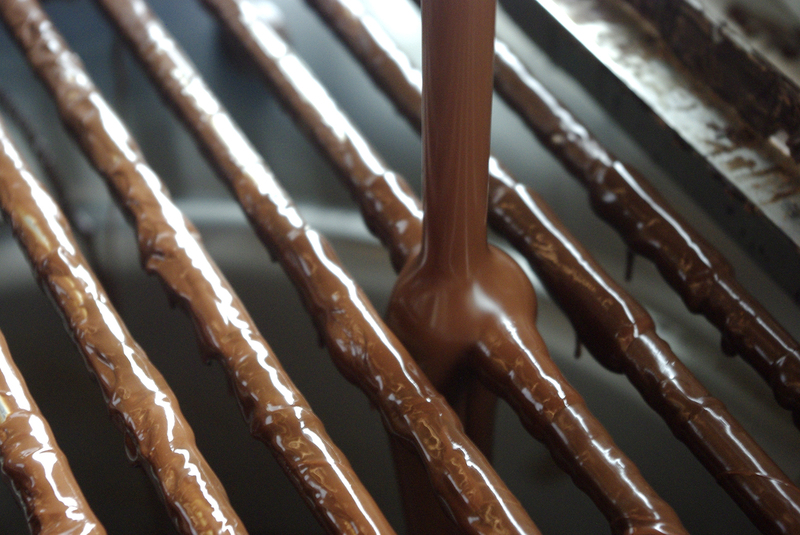 And of course, we'd tasted our chocolate many times by now. Delicious! It was very fruity, almost tangy, with hints of citrus. Insane that all this flavor came just from the bean! And, having tasted every stage along the way, I could very much recognize the flavor of the roasted bean in this finished chocolate. We made some other things with our chocolate, too! We made hundreds of these little tasting squares. We made up a batch of buttery smooth caramel and used these little cacao pod-shaped molds, making caramel filled chocolates. 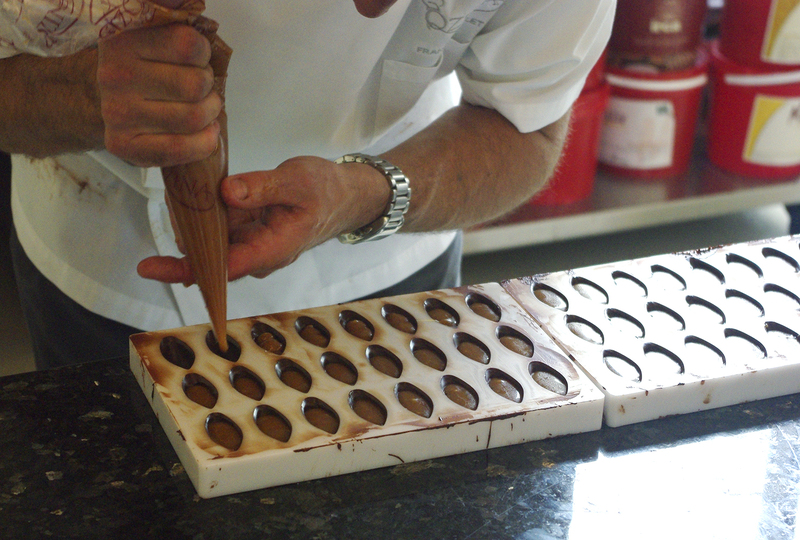 Chef Francois added a touch of sea salt to the top of each when we took them out of the molds. This caramel was insanely good! I made sure to write down the recipe. And that was it! We were done! 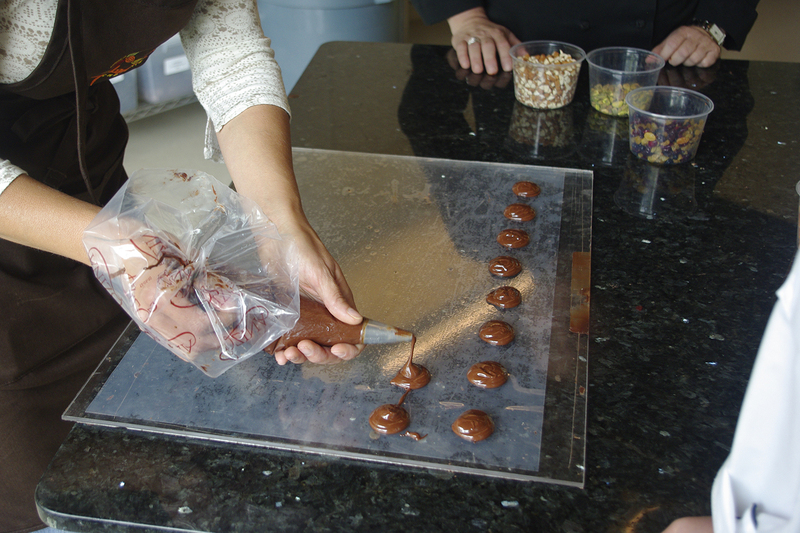 We'd turned 30 lbs of cacao beans into 20 lbs of amazing chocolate, then made candies and tasting squares with it. There's almost no better way to spend two days! We also made some chocolate mousse the first day, which is what you see in the middle in the picture above. 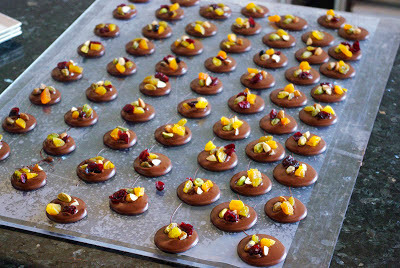 We used different chocolates they had there in the kitchen to make them. 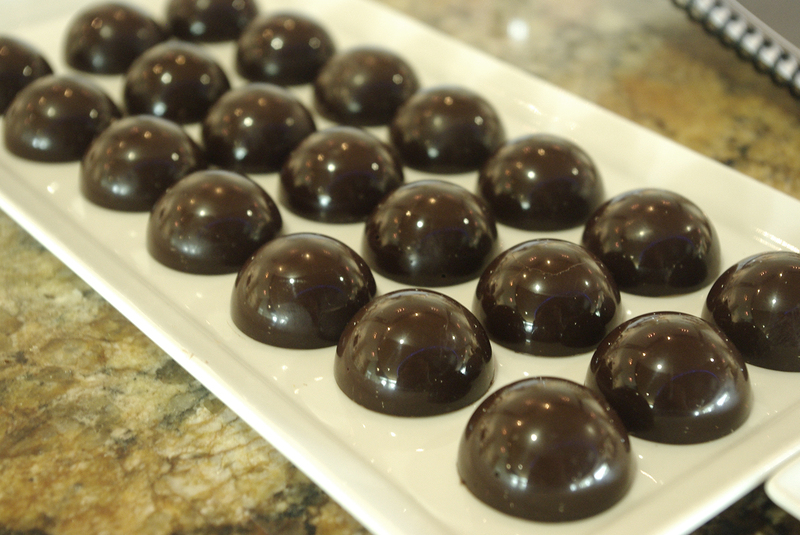 Our finished raspberry bon bons. The completed caramels, topped with sea salt. 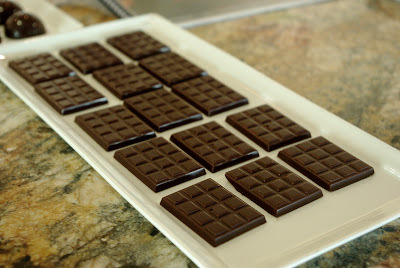 Our tasting squares, just the pure chocolate. And our mendiants. 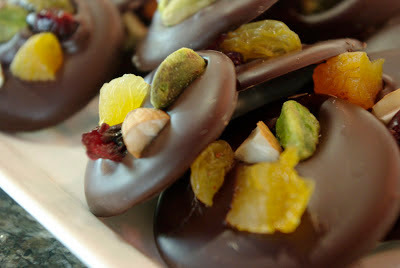 With the fruits and nuts, and knowing how pure the chocolate was, these almost felt healthy to eat! 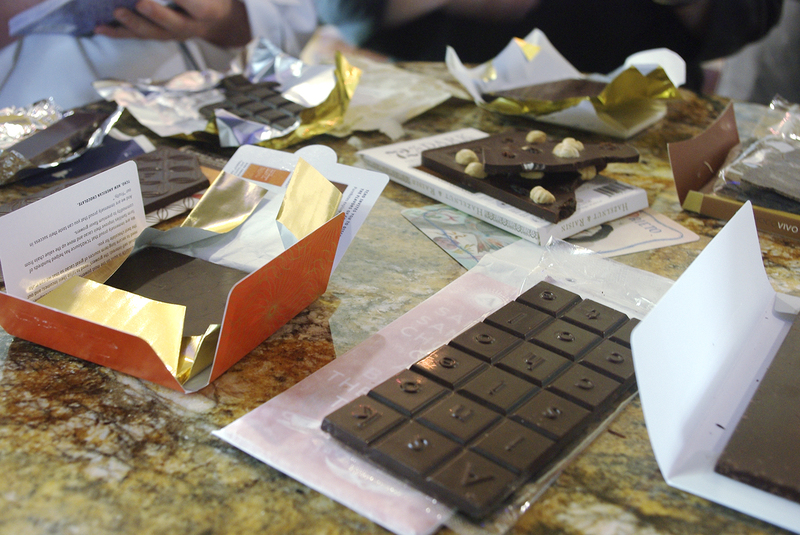 Also, during the first day, we all talked about why we were there taking the class, our love of chocolates, and the great variety of artisan chocolate makers that are out there now. 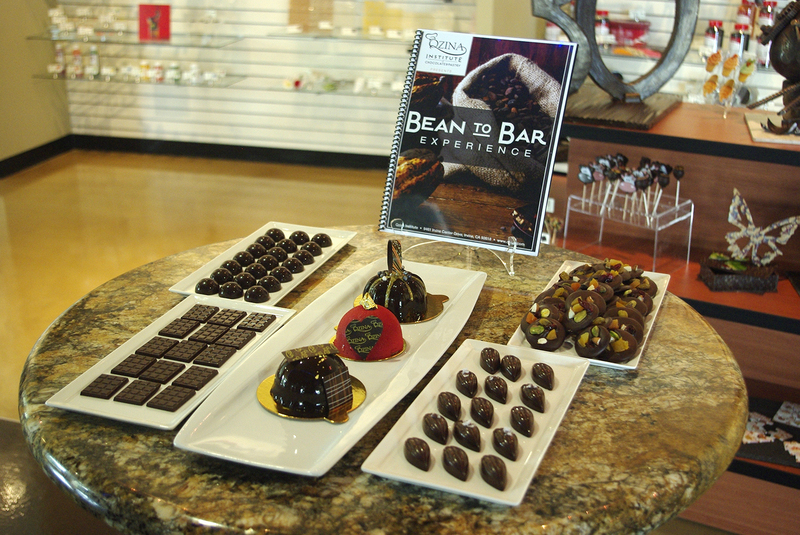 On Day Two, a couple of us brought in some artisan chocolates, and at the end of the day, we had a little chocolate tasting party! Holy cow, this was just astounding! Trying all these amazingly different flavors, and having our own chocolate there to taste with them. The variety was just unbelievable. Recently, a lot of high end chocolate makers have been giving out chocolate and wine pairing advice, or even chocolate and cheese pairings. You should try them! Or, like we did, just get a bunch of artisan chocolates from around the country (or world), invite some friends over, and taste all of them, compare them, see how different they are. You'll be amazed. 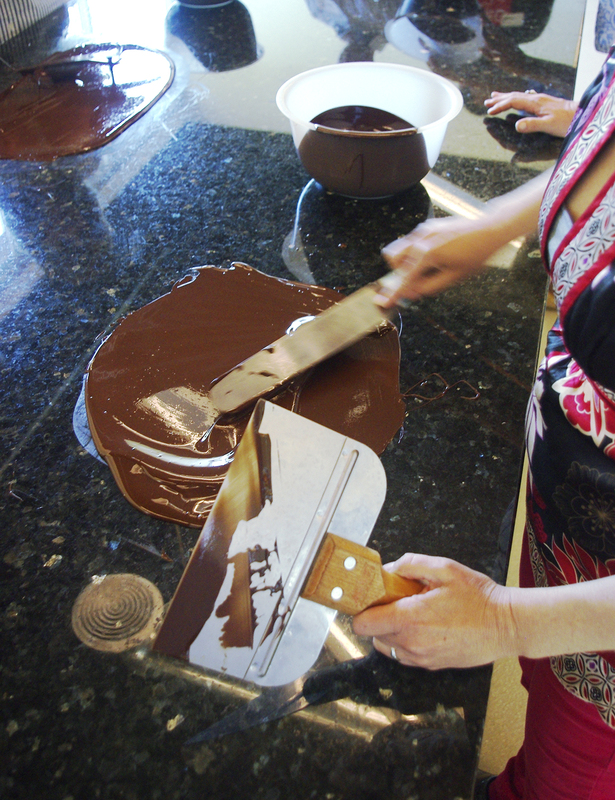 And that was chocolate making class! 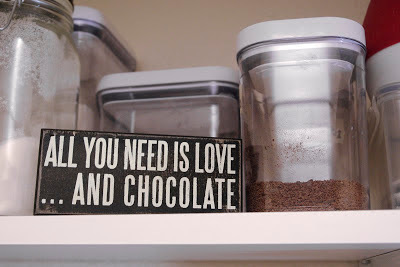 I left with a big box with over a pound of the chocolate we had made, and if you know me or have been following this blog, you very well know I plan on making a hot chocolate with some of it. If you're in the Los Angeles area and are interested in taking this class, keep your eye on Qzina's website. At the time of this posting, they haven't yet announced another class, but I'm sure they will.